The Philippines dropped their first match in the AFF Suzuki Cup after bowing to Vietnam in the first leg of the semifinal tie Sunday evening in Bacolod. Sven-Goran Eriksson's Azkals were caught flat-footed by the speed of Park Hang-seo's Golden Dragons and were made to pay with their sloppy backline as they head to Hanoi needing to win by two clear goals on Thursday. 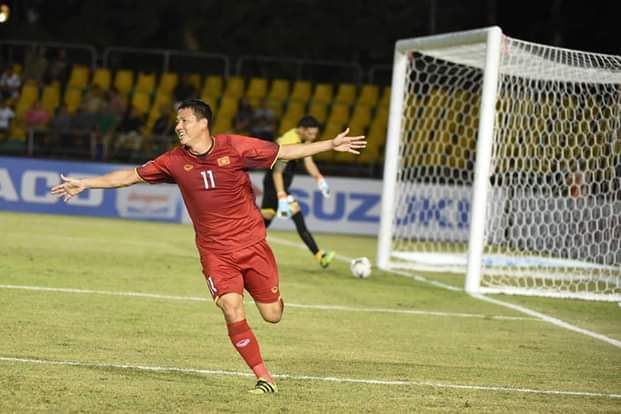 Nguyen Anh Duc and Nguyen Trong Hoang waited for the revenge that was eight years in the making, with the former scoring the match's first twelve minutes in with a fluke header after latching on Doan Van Hau's long ball that left Michael Falkesgaard no chance. With a loud Panaad showed up and responded well to Phil Younghusband's call, the home side have wasted numerous chances to equalize, until Patrick Reichelt poached into the six-yard box to level the semifinal deep into the first-half stoppage time, pouncing in the left-footed cross by the skipper. But the draw would only last just three minutes after the restart, when Phan Van Duc made Adam Reed and Carli De Murga pay once again with their lazy defending to beat the Bangkok netminder on a 1v1. The Azkals have tried for an equalizer but Reichelt had to sky his close-ranged volley over the bar in the 82nd minute, and were close to be down 1-3 in added time only for substitute Nguyen Cong Phuong hit is strike wide to the left.